It must be tempting for an artist to think the painted, drawn or sculpted subject has a life beyond the canvas, page or block. This was maybe the original impulse of art – with cave paintings as an invocation for the success of the tribal hunt. Most paintings of beauty could be viewed the same way, as attempts to make desires real. Once we strove to possess mammoths; later we strove to possess landscapes and nudes. The artwork could be a talisman for calling ideal situations into being. At a stretch this can also explain why artists have painted hell, or suffering, or war. Desire may be the only motive power of the mind, in which case we have more sadistic or masochistic desires than we generally know. An artist can even yearn for a god. 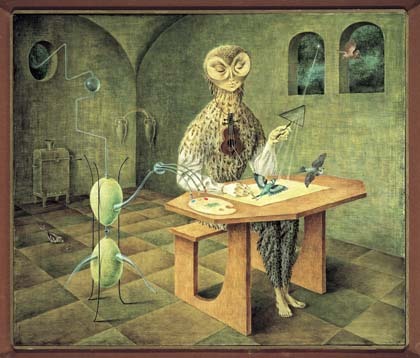 In The Creation of The Birds (1957) Remedios Varo summons one up from her own imagination or perhaps some esoteric text. This painting is not all that different from a classical sculpture of a god of antiquity or a later western representation of the Christian God, or his son, or any other of the saints, etc. Varo invokes her goddess through paint. Fine brushstrokes focus the mind. Inventive details (prism, violin string, and paint machine) make the desired being plausible. It is a prayer, or perhaps a spell, or is there any difference in terms of art? The Creation of the Birds is on display in the show Surreal Friends, Pallant House Gallery, Chichester, until 12 September.